Three goals in the final 20 minutes helped Kilmarnock finally ease past Berwick in the Scottish League Cup. Darren Lavery cancelled out Kris Boyd's first half penalty with a brilliant effort on 55 minutes, threatening to worsen Killie's torrid start to the season. But Rory McKenzie's deflected strike and a solo effort from Craig Slater turned the game. A sensational last-minute goal from Kallum Higginbotham sealed the victory. Kilmarnock boss Gary Locke made five changes following their 4-0 thrashing by Ross County with Josh Magennis and Higginbotham dropping out along with injured trio Darryl Westlake, Lee McCulloch and Mark Connolly, making for a youthful line-up featuring eight home-grown players. Killie conceded two goals inside five minutes on Saturday and they struggled to get the ball under control in a nervy start. Blair Henderson and Michael McKenna shot just wide for Berwick but the visitors shot themselves in the foot when McKenna tripped Greg Kiltie just inside the box. Boyd found the bottom corner from the spot. Jamie MacDonald soon pushed over Lavery's shot but Kilmarnock took control. Boyd could have had a first-half hat-trick, heading inches over from McKenzie's cross, hitting the post from 20 yards and seeing another header cleared off the line. McKenzie missed a sitter after a clever flick by Aaron Splaine, who soon forced a decent stop from Kevin Walker. But the hosts slacked off after the break and Lavery took down a long ball, turned and curled a left-footed shot into the corner from 22 yards. Kiltie and Boyd were denied by brilliant goal-line clearances from 42-year-old Berwick player-manager Colin Cameron, Locke's former Hearts team-mate, before the hosts regained the lead. McKenzie worked space in a crowded penalty box to get a shot away and it was deflected past Walker from 16 yards. Berwick had loud penalty claims rejected when Henderson claimed he was held by Mark O'Hara but Slater settled matters when he burst through the middle and dinked over Walker. The midfielder hit the bar moments later but Higginbotham stole the show with a first-time effort into the top corner from 30 yards. Match ends, Kilmarnock 4, Berwick Rangers 1. Second Half ends, Kilmarnock 4, Berwick Rangers 1. Attempt blocked. Darren Lavery (Berwick Rangers) right footed shot from outside the box is blocked. Foul by Dean Hawkshaw (Kilmarnock). Goal! Kilmarnock 4, Berwick Rangers 1. 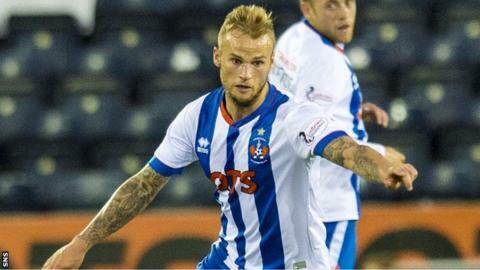 Kallum Higginbotham (Kilmarnock) right footed shot from outside the box to the top right corner. Assisted by Tope Obadeyi. Substitution, Berwick Rangers. Barry Hogg replaces Finn Graham. Substitution, Kilmarnock. Dean Hawkshaw replaces Craig Slater. Kallum Higginbotham (Kilmarnock) wins a free kick in the defensive half. Substitution, Kilmarnock. Tope Obadeyi replaces Aaron Splaine. Substitution, Kilmarnock. Kallum Higginbotham replaces Greg Kiltie. Aaron Splaine (Kilmarnock) hits the bar with a right footed shot from the centre of the box. Corner, Kilmarnock. Conceded by Graeme Beveridge. Goal! Kilmarnock 3, Berwick Rangers 1. Craig Slater (Kilmarnock) right footed shot from the centre of the box to the bottom left corner. Substitution, Berwick Rangers. Ross Graham replaces Colin Cameron. Attempt missed. Stuart Findlay (Kilmarnock) left footed shot from outside the box misses to the left. Corner, Kilmarnock. Conceded by Dwayne Coultress. Goal! Kilmarnock 2, Berwick Rangers 1. Rory McKenzie (Kilmarnock) left footed shot from the centre of the box to the bottom left corner. Assisted by Mark O'Hara. Corner, Kilmarnock. Conceded by Jonathon Fairbairn. Corner, Kilmarnock. Conceded by Kevin Walker. Attempt saved. Kris Boyd (Kilmarnock) left footed shot from the centre of the box is saved in the centre of the goal. Attempt blocked. Craig Slater (Kilmarnock) right footed shot from the centre of the box is blocked. Attempt missed. Michael McKenna (Berwick Rangers) left footed shot from outside the box is close, but misses to the left. Corner, Kilmarnock. Conceded by Ewan McNeil. Corner, Kilmarnock. Conceded by Blair Henderson. Attempt blocked. Steven Smith (Kilmarnock) right footed shot from outside the box is blocked. Goal! Kilmarnock 1, Berwick Rangers 1. Darren Lavery (Berwick Rangers) left footed shot from outside the box to the bottom left corner. Assisted by Blair Henderson. Attempt missed. Kris Boyd (Kilmarnock) header from a difficult angle on the right is close, but misses to the right following a set piece situation.